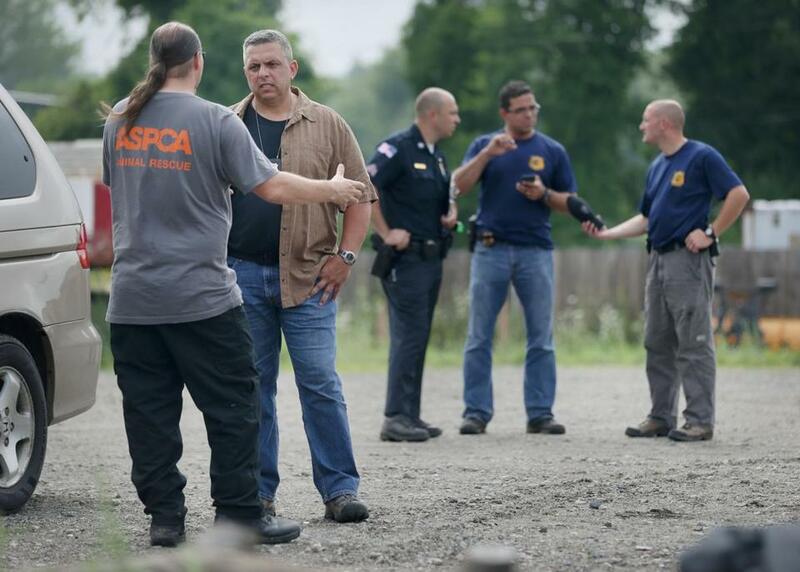 Tim Rickey, vice president of field investigations and response for the American Society for the Prevention of Cruelty to Animals (left) spoke with Westport Police Department Detective Jeffrey Majewski. WESTPORT — Animal welfare officials declared Friday that conditions on a derelict farm here constituted the worst case of animal cruelty they’d ever encountered in the Northeast. A team from the American Society for the Prevention of Cruelty to Animals has been on site for a week, feeding and treating about 1,000 neglected animals as local, state, and federal authorities investigate. The situation at the 71-acre tenant farm is so dire the animals must be moved to a temporary shelter for ongoing treatment — the largest-ever operation of its kind in the Northeast, said Tim Rickey, vice president of field operations at the ASPCA. For nearly two weeks officials have investigated allegations of widespread abuse on the farm, which is divided into 20 plots managed by individual tenants. Westport native Richard Medeiros owns the property and has been the subject of a past investigation of animal abuse. Neither Medeiros nor his lawyer could be reached Friday for comment. Moving all the animals will require several tractor-trailers and could take up to five days, Rickey said. Goats, cows, horses, chickens, and pigs are among the animals populating the land. “Logistically, it’s a huge operation — it’s not only a huge number of animals, it’s multiple species of animals and multiple conditions,” he said. The move will begin after the shelter is completed, Rickey said. Town officials worked with a resident to arrange a short-term lease on another farm, said Westport Police Detective Jeffrey Majewski. There, the ASPCA will set up fencing, pens, and shelters to house the animals while doctors treat them. The animals will remain in ASPCA care until the criminal investigation concludes, Rickey said. Majewski said the attorney general’s office has worked closely with local police and may bring criminal charges against the owner or tenants. A spokeswoman in the attorney general’s office said it is policy to neither confirm nor deny involvement in ongoing investigations. Westport police will continue their investigation, equipped with another warrant to search for buried animal remains, Majewski said. Officers said that in interviews many tenants reported that animal remains were buried across the property. Majewski said that would essentially mean Medeiros was running an unlicensed animal cemetery. Officers have already uncovered decomposing remains and bones. As gruesome as the scene was at the start of the investigation, Majewski said the animals’ health has improved noticeably since the ASPCA and other organizations arrived. After the latest investigation into the property began, local authorities blamed one another for failing to oversee conditions there. Majewski said the responsibility falls on the town’s Board of Health, which appoints animal inspectors who report to the state if they find anything amiss during yearly farm checks. Health officials said their inspector checked the property in January, saw nothing wrong, and therefore could take no further action. Majewski, however, said the squalor there should have been obvious.